Everybody loves a good bingo offer. 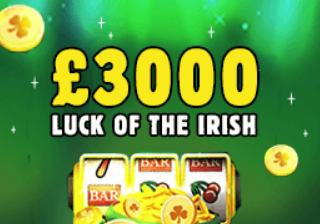 Over at Becky’s Bingo, they are celebrating St Patricks Day with a fantastic prize draw where you can win a share of £3,000. So what do you have to do to join in? Read on to find out. To take part all you have to do is Opt In at Becky’s Bingo and for every £20 that you spend on any of the Irish themed slot games, you will receive one entry into the Prize Draw. This promotion runs from Monday the 12th March up until Sunday the 18th March. 1st prize is £1000, 2nd prize- £500, 3rd prize – £300 and £3,000 will be shared amongst 69 players. Qualifying games are Lucky Clover, Irish Gold, Irish Luck, Finn and the Swirly Spin, Fiddle Dee Dough and Luck O’ the Jackpot. For every £10 that you spend on Reel Rush, Jungle Spirit: Call of the Wild or Dazzle Me slots you will earn yourself one entry into the 25K Lucky Spins prize draw, up to a maximum of 50 tickets per day. This promotion runs from the 12th-18th March and the prizes are as follows – £5,000 for the 1st prize, £3,500 for the 2nd prize, and £1530 for the 3rd prize. The 4th – 1500 will receive £10 each. Play the super games in the 90 ball bingo room at 8,9,10, and 11pm every Friday and Sunday for the chance to win a share of the £800 prize pot, and head over to the Village Inn on a Saturday at 9.50pm, 10.50pm and 11.50pm and try your luck for a share of £300. Tickets to these games cost just 20p each and are available in the lobby. All new player who sign up with Becky’s Bingo can claim a 400% match deposit bonus, so if you deposit just £10, you will have £60 funds to play with which includes a free £10 bonus.